Rdio on Friday responded to this week's announcement of Apple Music, satirizing Apple marketing from 1981 as part of an argument that the company is doing nothing fundamentally new. "Welcome, Apple. Seriously. Welcome to the most exciting and important frontier since the digital music revolution began 16 years ago," Rdio said, according to The Next Web. 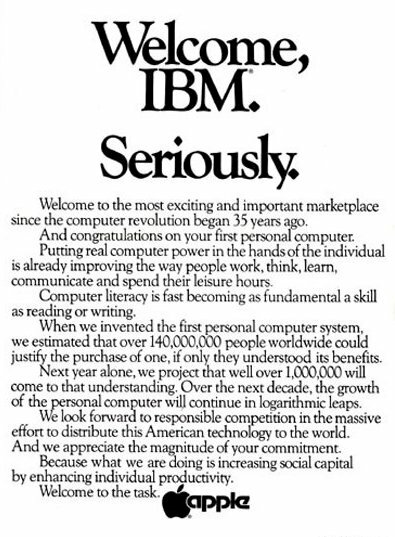 The words paraphrase Apple's response to IBM putting out its first personal computer. IBM-compatible PCs would eventually come to dominate the global computer market. Rdio CEO Anthony Bay reportedly argued that iTunes began "really clean and simple," but has "gotten messy" since, and that Apple Music could get lost in the shuffle for people navigating its content. "So you have Apple Music next to podcasts and e-books and 'rent a movie' and 'buy a TV show', plus your own music, there's a risk of it being very confusing," he said. The executive described Rdio as a specialty shop next to Apple's department store. He further criticized the originality of Apple's efforts. "When you look at where Apple has done remarkable things, it's when they do something new: the original Mac, the iPod, the iPhone, the iPad - those are all 'wow'. "This is not that. This is another version of music," Bay remarked. He nevertheless suggested that there is room for many different streaming services, since they all share similar music libraries. Apple announced Apple Music during Monday's WWDC keynote. The service will launch on June 30, and eventually come to 100 countries, more than Rdio's current 85 and Spotify's 50.